Finally, I started writing about the Urhyme project. I have spent a lot of time on building a map out for Urhyme project and development. Last week, I was deeply moved by Urhyme product. Four years ago, I always wanted to make Urhyme product through the web, but I was unable to make it happen due to school work and studying abroad. In fact, I was not able to make a successful product because of my lack of skills in full-stack. I was quite lacking in experience and expertise to develop everything on my own. Today I start to tell the story of the Urhyme project at Medium. 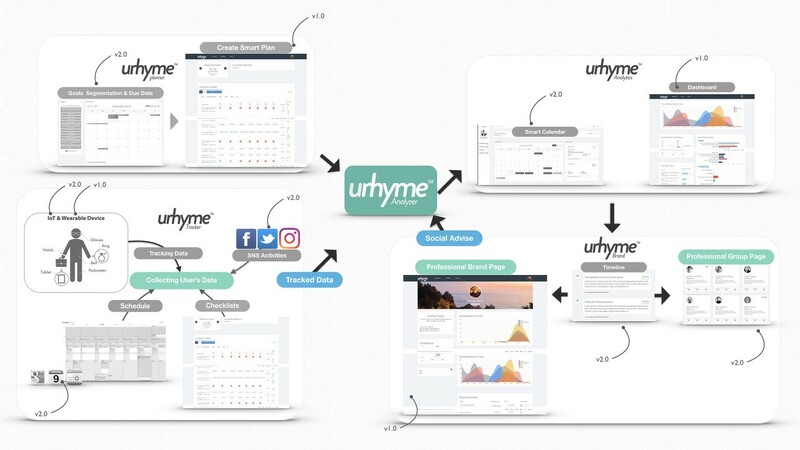 Urhyme is primarily created based on ideas for managing my life plan and methods to web service. We make plans throughout our lives. We set our priority in life, priority in work to make sure that we focus toward reaching our set of goals. Obviously that most people make their plans for future. However, my method of the life planning is unique because it is based on people’s lifespan of hundred years. There is the significance of planning lifespan of hundred years, why hundred years? Because I believe that I could live up to hundred years. Before we talk about my theories, let’s go back to my eight years ago. In 2008, I was twenty years old student who gave up my first startup, and I was wandering around due to the failure of a first business. Nobody cared or say anything about me labeled as someone who failed first business, but I was drinking heavily every day and partied all night. Therefore, I was living strenuous day to day lives as a result of weight gains, and overlap with Korean military duty problem. Since I could not live like this, I started working out, tried to go out on a date. Thus, I could meet my girlfriend (Cloie). Looking at her studying diligently, working toward the positive direction in socially, I felt a very lack in my skills due to the frustration of business failure but she gave me a little mission to help me motivated. First, I had to resolve the Korean military duty. Somehow, I have solved it as alternative military service (working at the IT company), but soon I was not able to see Cloie often due to the software company’s scary work overtime at night and stay up all night due to the heavy work duties. After half a year, Cloie decided to study abroad in the United States, and I was given a mission to work overtime by other means. After I strive to seek new opportunities, I successfully moved the other company as a better circumstance and salary. After a year, Cloie came back to South Korea from the USA. At that time, I was given a mission to graduate from school, and she wants me to have detailed plans for a future. I would be twenty-nine years old when I graduate from school, I saw my friends, and they were working as freelancers, get a job and continue to work, so I have decided to study abroad since it is already late. For several years, I went to a numerous institute, did school projects, and studied tests with friends who were six years younger than me. As results, I could graduate from university. After my study abroad in the United States was accepted, I successfully married to Cloie last year. Through my twenties with Cloie, I felt that I must go through right path and advance in the right direction to live my dream life. If you were given a goal, you could achieve these goals if you continue to move toward the goal ignorantly. I had no working level experience; my English test score was awful when I have decided to study abroad. I had to retake courses to graduate, the process of masters and doctor’s degree (Ph.D.) was very different than what I was thinking. I had to change myself. However, I doubted myself many times. However, I think that I could reach my goal of living a desired life before my thirties because I ignorantly chased my goal. I have too many things that I want to do right now, but I also have a lot of things that I want to do later. I came with idea of bucket lists: which include going on a round-the-world cruise in Northern Europe, travel, do something at a new places, boarding on something, etc.. I was wandering among the things that I wanted to do so much, and Cloie decided to motivate me to work on what I needed to do at the age of twenty so that I could choose the right paths and concentrate on what I really need to do. I had to work on areas where I lack in; I had to make choices and concentrate. However, I asked myself that should I give up everything that I want to accomplish, I thought about it for a while, and I realized that if I am healthy enough, I could achieve goals that I want to do. Suddenly I thought about “how long would I able to live up to?”. Therefore, I thought myself that I am sure that I will live up to eighty years old, but I found many types of research that claiming that average life expectancy is rapidly increasing over eighty years old since the 1900s. 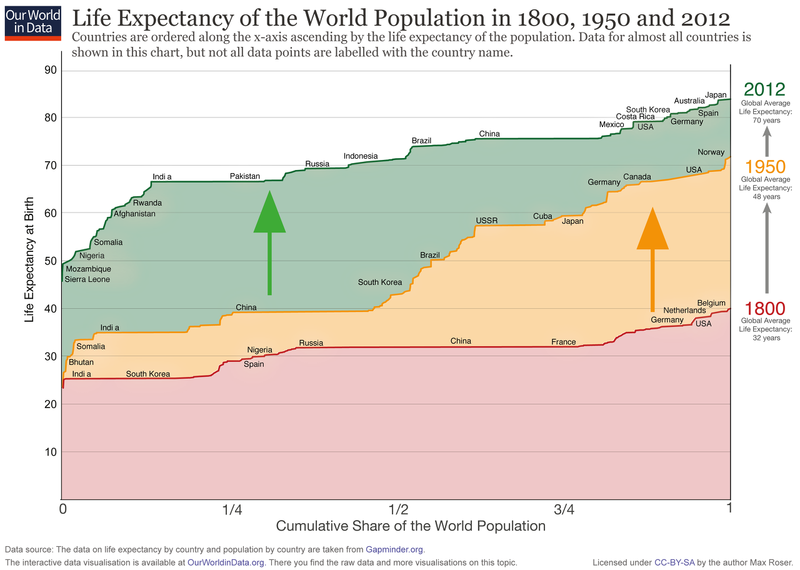 The website, OurWorldinData reveals that average life expectancy for each country persuaded me that I could live up to hundred years old since I already quit smoking, lose weight, and maintain the healthy lifestyle. Since then my life changed dramatically. Let’s say that I live up to hundred years old, excluding my teenage years, I still have seventy-five years of lifespan, I thought about it in the year, 2011 which tells me that I only lived twenty-five percent of my life. I found it funny because earlier I mentioned about my frustration about failure in business which only takes up to twenty-two percent of my life. Let’s assume that I still have seventy-eight years of life ahead of me, then, of course, I thought that I could achieve everything I want to do. However, I just had too many lists of things that I want to achieve; I just did not know what to do first. At the time, I coincidentally looked at my twenty years old life of roadmap in the year of 2006; I realized that I did not even achieve five percent of what I want to do in five years. Therefore, I thought that I need to have the roadmap to help me achieve my goals. So, I have realized that I could document and revised my plans and goals every day. In other words, I created very detailed and specific roadmap. I spent about three hours working on creating documents, and about eight pages of roadmap were created. And I tried to follow on the yearly, monthly, weekly plans and goals. On Monday, I made a new plan, and I make a self-reflection for the week. This is very simple, but having these as specific documents helped me to change myself than days when I used to rely on ordinary tasks and other tools. I have created documents that I am fully satisfied with. Franklin Planner? GTD? Most importantly, I think that I need to see my plans and goals and check it regularly throughout the life. Since I have been using my roadmap for several months, I felt like it helped me to manage my plans and goals to some extent, but the data expanded and the word files became extremely big which troubled management. But most importantly, I was not able to see it. Therefore, after half a year which was 2012, I started managing excel. Since 2012, I started my self-management by excel from the word. Simply, at the top is documented as since the year 2011 to reach seventy-five years which is the year 2085, divide this into the 10-year unit, in other words, the age categories are divided into 20 years old/30 years old/40 years old…80s/90s then I wrote things that I want to do. On the twenty years old, I wrote about going to study abroad in U.S., enter graduate school and work as U.S. engineer at the age of 30… etc. After that, I divided categories by things that I want to do. The categories are divided into health/ knowledge/ qualification/ study/ honor/ achievement/ society/ job/ happiness/ material. I also made subcategories. For example, the health category is divided as 75kg/moderation in drink/ habit/ style/ early bird person (Person who wakes up early). The knowledge category is divided into English/ programming/ design/ music. At first, the yearly plan is created by making the plan for hundred years; Only the applicable year category is used when making the detailed plan. The plan starts on every January 1st, the period is applied to the detailed plan. The monthly plan is also created after making the yearly plan; applicable ‘monthly’ category was used to see how long it will take by making deadlines. The plan is categorized as habituation/ achievement; the habituation is checked per week throughout the day (three times a week or every Monday, Thursday, Friday). For achievement is categorized as person’s weight in kg, or study progress by percentage. Weekly plan is a process where I record my real data. The divided monthly plan is classified as “by the week,” and identifies and records whether you finished the tasks as yes/no, the actual number (weights…) or thing that you did on that day (food record, what exercises you performed). 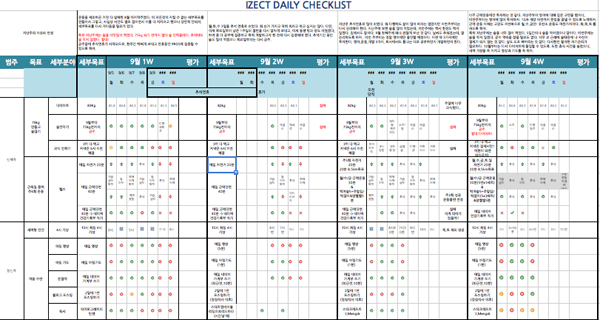 Therefore, checklists for a day was created as below demonstrates about daily lists of plans. Why should I divide this up like this? By looking at the above, the checklist for August, second and third weeks were not recorded. Especially, the first week is most marked in red. Of course, September also has some empty columns in the middle, but it is relatively good compared to August. Then if you look at this checklist, it reveals what I have done so far, it obviously shows that in August, I have not followed my plan and goals and I did not live up to the expectation of my planned life. I spent about one hour a day to document this checklist. Of course, I also had other tasks besides creating checklists, I tried to wake up at early dawn at around 4 to 5 a.m., and I tried to sleep by 10 p.m. Eventually the checklists demonstrated that in August, I was not able to sleep by 10 p.m. or I was unable to wake up early. After all, the dividing plan is my main emphasis on self-management. Above organized process reveals next process of planning. Throughout splitting this plan, I could go from “abstract dream” to “Today’s to do lists,” things that I ignored doing became new goals to achieve at the age of “from forty-three to forty-five,” it allowed me to decide a specific due date. The things that I did not check revealed which was good and bad. For this reason, I kept revising and securing plans. Five years have been passed since I managed planner. The data has accumulated considerably. Weight, wake up time, study lists, type of foods, type of exercise, exercise time, meditation status, even places to go for going out on a date, what I did, but no matter the system is outstanding, if people do not use it, it becomes a useless tool. I also had times when I did not want to use planner at all, despite that I have spent a lot of time creating this planner. I rarely used my planner despite that it did not require the use of the internet when I was traveling Europe or U.S. for a month. More importantly, no matter how much data is accumulated, there should be a “retrospection” of it, but the reflection of one week or the reflection of one month is somehow managed, and when the data is accumulated for one year, there is a too much data to organize, so I doubt myself whether it is doing a good job or not. After all, it is hard to see at a glance since the planner has too much data. Excels formulas, I tried using it as chart, but it was hard to make it standardize since the data had other information besides numbers. Along with that, I had to create monthly/yearly excel sheet, but it took a lot of time than I expected. Nowadays, I assumed about the rapid development of skills in Spark, big data/ machine running related open source to overcome with the ‘retrospection.’ Just in time, three years ago, I also took the class in AI, with that time’s little knowledge, I thought that automation assessment was possible. Despite the large quantity of data, docker, microarchitecture became very activated, I thought that automation of load balancing, scale in/out, etc. is very easy to do with little cost. I thought that the if I put running in, and record whether I did good or bad in computer, the data would accumulate, and it would measure itself automatically, I could make a standard based on other peoples’ evaluation on me if I decide to put in social, I could also compare with people who did good. To overcome ‘visualization,’ in the lead of D3.js, Chartist, and many data visualization library became available, only applying Bootstrap skin, use angular then create reaction type web. (In fact, this would seem easy but making intuitive UI was hard… and I have a lot more things to do.) It does not matter how you do it; I think that UI is better than excel, I thought using chart diligently would gradually show me data. I have been making websites for twenty years; I am very confident in developing web. Therefore, I started to make service web as I mentioned above. In fact, I needed a research topic as I prepared to study abroad in U.S. last year, I needed specific ‘plan.’ Therefore, I started a project in 2014. I was worried about the name of my project, and my wife, Cloie told me that this system seems like making my life plans together, so she said how about we name the project as ‘we.’ As I was searching for the domain, I saw Urhy.me, so I registered it, and I found out by reading it that ‘urhyme.’ I found it very coincident, “rhyme,” I saw it as meaning as finding the process of life’s ‘harmony,’ I found it as very pleasing, so I have decided the project as urhyme. Of course, I have not completed the project as I prepare for study abroad in U.S. and study for master’s degree, anyway I finally made private Beta in the last week. If you make the plan, deciding goal, set a period, choose data source, and register from the checklist, it retrieves data automatically. And later, achievement graph is shown based on my category set up in the past. Namely, let’s say I set my goal as losing 10kg, if I link weight as the goal, the checklist automatically saves data collected from Withings WiFi Scale at home, the data is evaluated through the dashboard. The whole process is simply demonstrated in the diagram, as shown below. IoT, hashtags, calendar data, is not provided since it is beta, but it is shaped as web service provider. Lastly, Urhyme’s goals are to adjust my desired life balance through automatically collected life data, AI. And my goal is to use this to make my data visualization page. Anybody has right to have their dreams. Whatever the situation is, having the dream is free. But we do not know how to achieve our dreams well. Therefore, we read books, hear many people’s success story, experiences. I want many people to reach their goals based on their decisions, focus on their lives through Urhyme. I want my web to develop to not just criticize each other, but to share their process of reaching dreams, and encourage each other. 3. DevOps environment composition for C.I., C.D. Founder of Urhyme. Full-stack software engineer with 5+ years experience in large-scale web service.